The Maldivian currency is a remarkable depiction of the country’s rich culture and history. 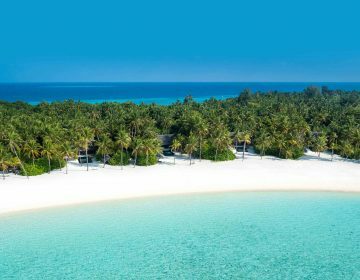 The currency is called the Maldivian Rufiyaa (MVR) or Dhivehi Rufiyaa in the local language, and the sub-unit is called the laari. 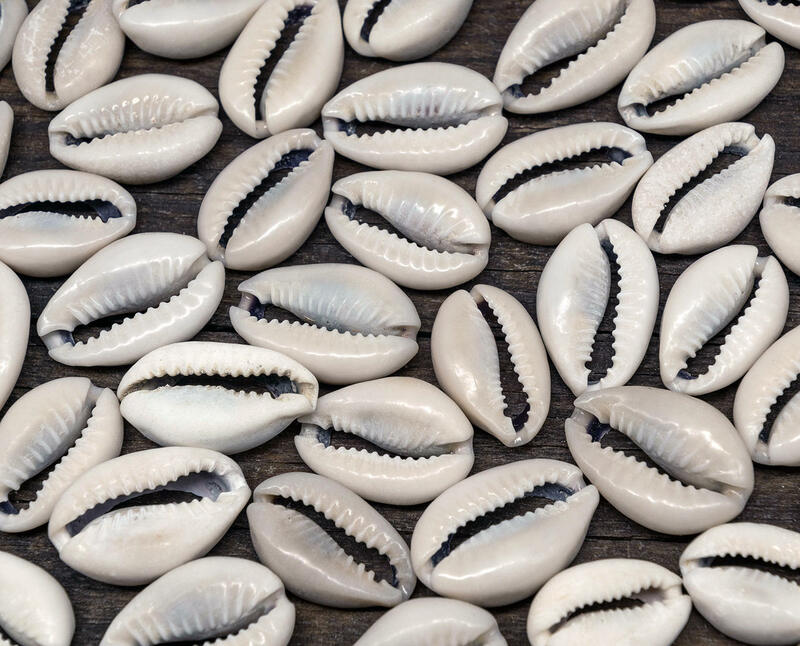 Maldivians used cowrie shells as their medium of exchange in ancient times dating back to 1200 AD. Cowrie shells have always been common on the beaches and reefs of the Maldives. Later, during the reign of Sultan Ibrahim III, long pieces of silver doubled over and stamped with the Sultan’s name dhigu laari were used as the standard currency. The first round coins laari fathi were used as a medium of exchange in the Maldives in the 17th century during the reign of Sultan Ibrahim Iskandar the First. These coins were of silver and relatively coarse. Later, they were also made from copper, lead, and gold. The first Maldivian currency minted and produced from abroad arrived in the country in 1913. Later, a full coin set was created during the reign of Sultan Mohammed Fareed the First. This set included coins of one laari, five laari, 25 laari, and 50 laari. 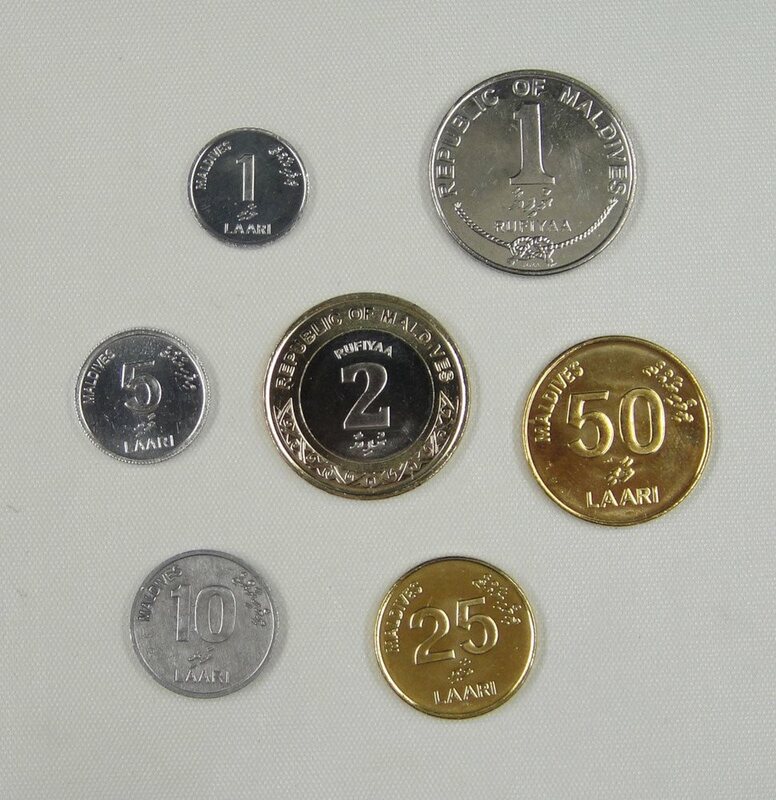 In 1983, one Rufiyaa coins were introduced, and the laari coins were redesigned. More than a decade later, two Rufiyaa coins were also produced. The Maldivian economy saw its first banknotes in 1947, with the signature of Mohammed Amin Didi who then served as the head of the Mahkamat Al Maliyyah (Financial Court equivalence to a Ministry of Finance). Mohammed Amin Didi would later become the first President of the Maldives, in 1953. The first paper money set included 60 laari, one Rufiyaa, two Rufiyaa, five Rufiyaa, and 10 Rufiyaa. Fifty and 100 Rufiyaa bills were introduced four years later, in 1951. The paper money was later updated with the signature by then-head of the Ministry of Finance Ibrahim Nasir in 1960. Nasir would then become the second President of the Maldives in 1968. During President Maumoon Abdul Gayoom’s administration, a newer set of banknotes were introduced by the Central Bank, Maldives Monetary Authority, with the President’s signature on his capacity as its Governor. 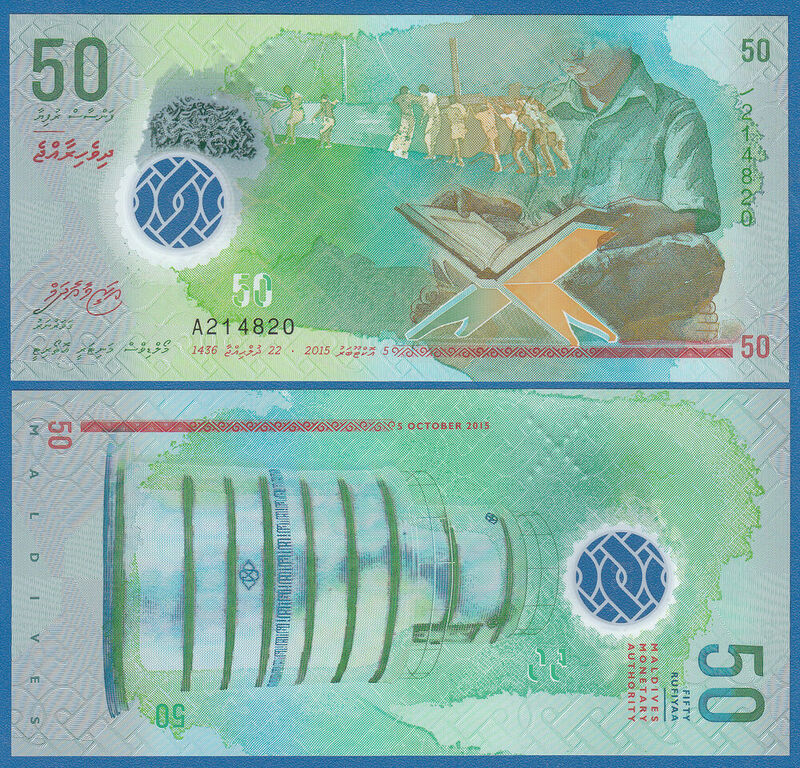 A 500 Rufiyaa banknote was also included in this new set. Over time, better and stronger security features were added to the Maldivian paper money. On the occasion of Maldives’ 50th Independence anniversary, a more modern and efficient banknote series was introduced under the name Ran Dhiha Faheh. This colorful series printed on polymer material with robust security features portrays the Maldives and its culture at its best. Aspects covered on the designs of these banknotes include flora and fauna of the island nation, Maldivian tradition and customs, and its culture at its best. 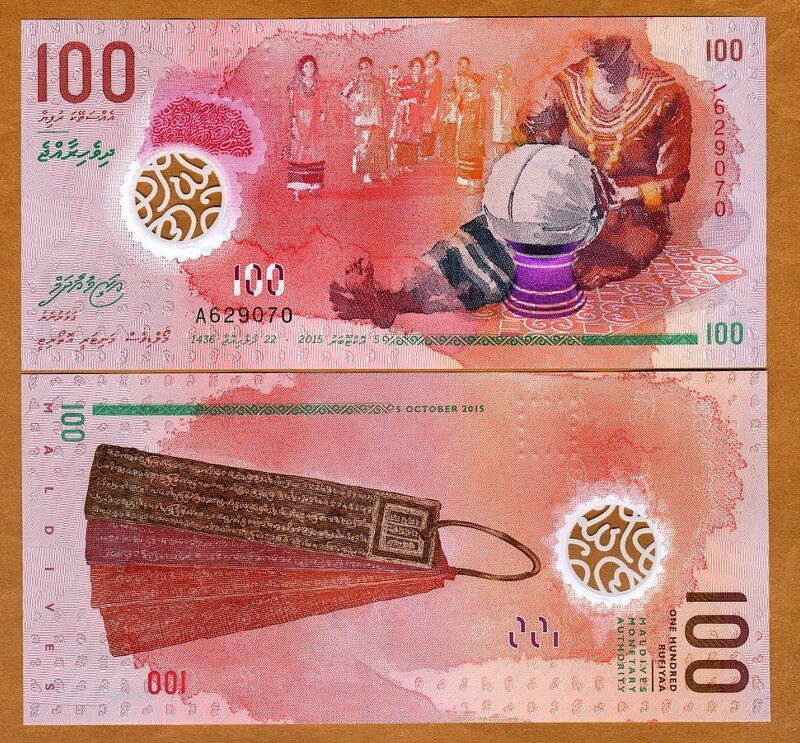 Banknotes of five, ten, 20, 50, 100, 500, and 1,000 Rufiyaa all with themed colors and exciting illustrations are now used all over the Maldives, while the older banknotes are now taken out of circulation. Every note comes with features that help the visually impaired to feel and identify them. The talented local designer Abdulla Nashaath designed the Ran Dhiha Faheh banknotes series. The notes were signed by Dr. Azeema Adam, the first female governor of the Maldivian Central Bank. The five Rufiyaa note is a neutral grey color. 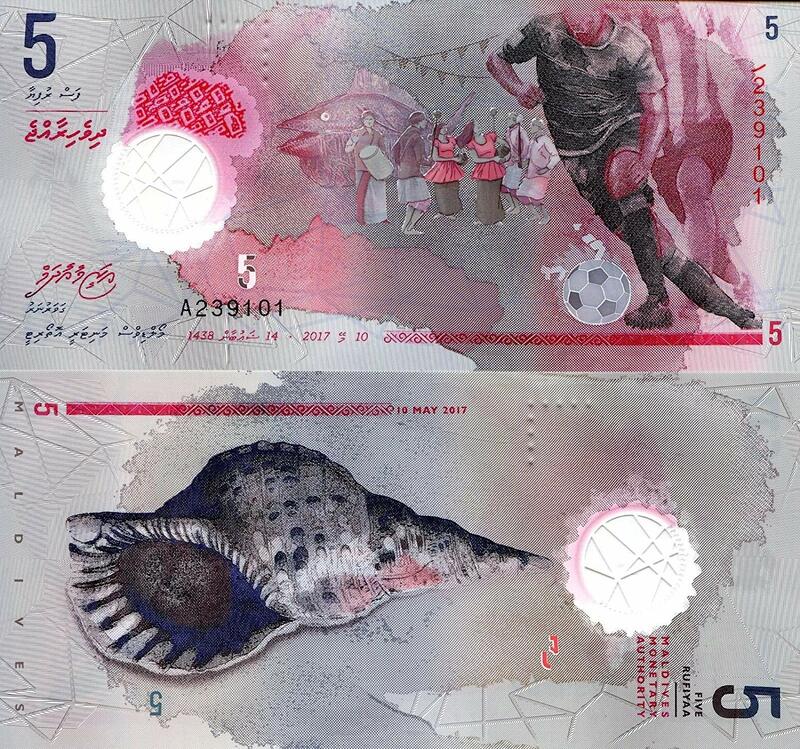 One face of the note shows men playing football, the most popular sport in the Maldives, while the other face illustrates a conch shell. 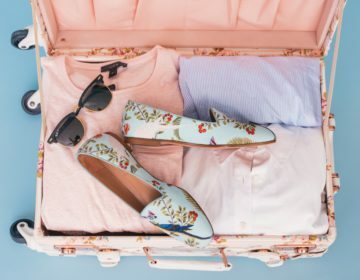 The conch shell was a medium used by the government in the early days for trade and social communications and serves an example of how far the nation has come in terms of modern communication. The golden-yellow color of this banknote represents the importance of upholding traditions. The front face of the note shows a toddy tapper climbing a palm tree. Toddy tapping or Ruh Erun is a traditional Maldivian occupation. The coconut palm has infinite uses for Maldivians from food and drink, to making shelter and vessels. 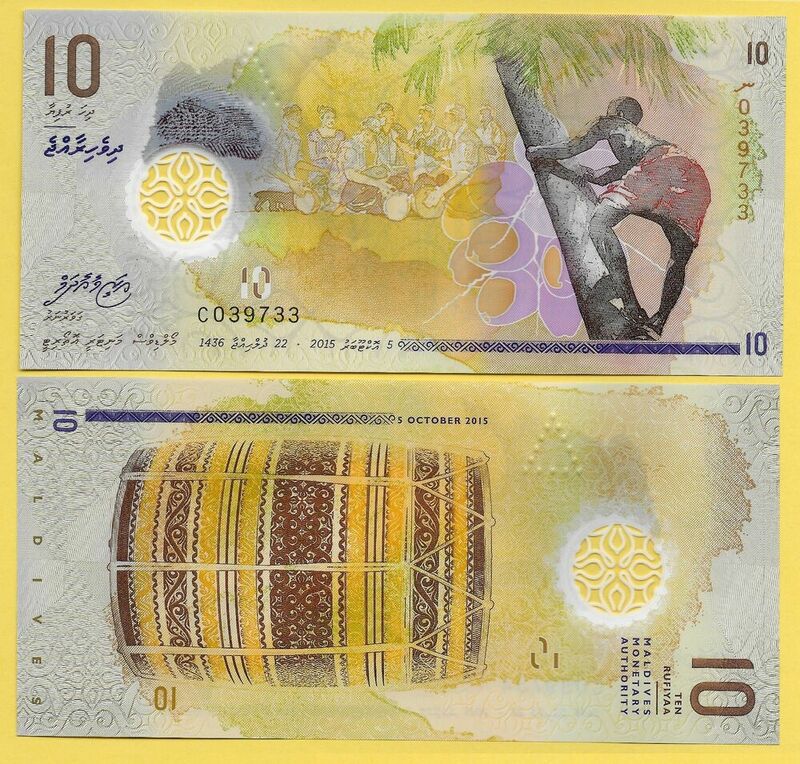 The opposite face of the ten Rufiyaa note shows a Boduberu (large drum), a traditional Maldivian musical instrument which is still used in making modern music in the Maldives. The Boduberu on the note is the oldest drum on display at the National Museum in Malé. Purple, often associated with wealth, luxury and status, is this note’s color. 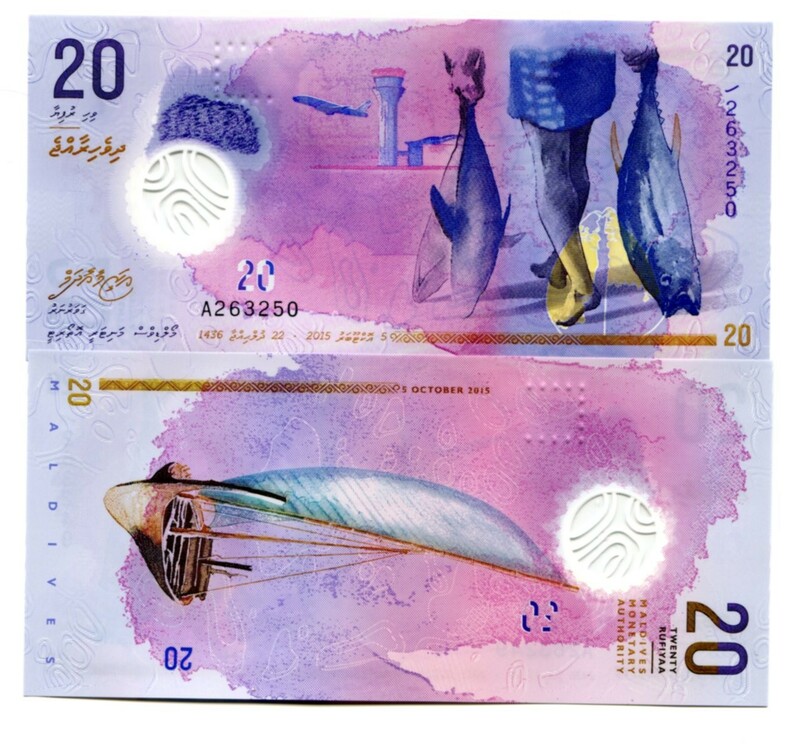 The first side of this Ran Dhiha Faheh note shows a Maldivian fisherman carrying a skip jack tuna and a yellow fin tuna – two of the most widely used fish in the Maldivian diet. The background shows an airplane taking off, depicting how far the Maldivian economy has progressed. The opposite face of the note shows a traditional Maldivian sailboat. In the Maldivian national flag, green represents peace and prosperity, whereas the color neutralizes this Ran Dhiha Faheh note with the Maldivian Islamic identity. The note shows a boy reciting the Holy Quran, and a portrayal of Maldivian unity appears in the background, in the form of a group of people pushing a dhoni into the sea. The Munnaaru (minaret) of the Hukuru Miskiy (Friday Mosque) in Malé both being historical monuments appears on the opposite side, representing the Islamic lineage passed on from Maldivian ancestors. This note with its color of red like in the Maldivian national flag represents nationalism. The front side of this bright red banknote shows a woman in the traditional Libaas dress, working on the Kasabu neckline of a similar dress. A group of women wearing Libaas can be seen in the background as well. The opposite face of the note shows the early Dhivehi scriptures on the Dhan’bidhoo Loamaafaanu (copper plates). The scriptures appear in the Old Dhivehi alphabet, Dhives Akuru. 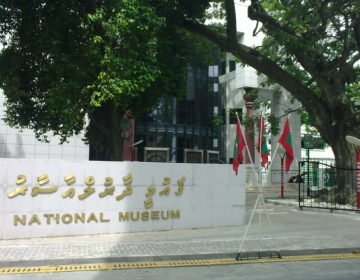 The Dhan’bidhoo Loamaafaanu is now displayed at the National Museum in Malé. 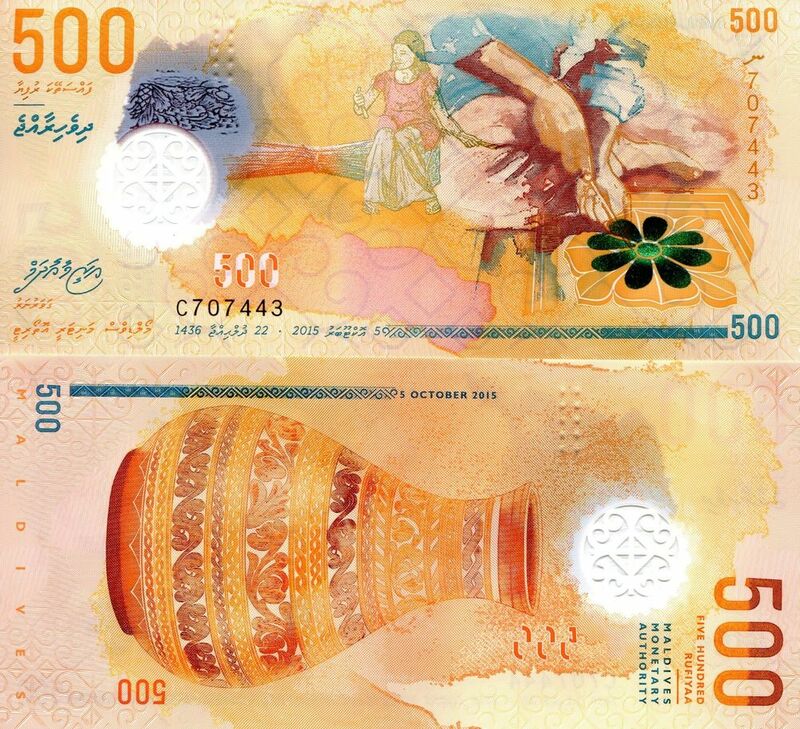 Orange is associated with energy and creativity, and that is what the illustrations on the 500 Rufiyaa banknote portray. The front face of this banknote shows a woodworker fashioning a complex, yet beautiful design using a mallet and chisel. A woman is seen in the background making a coconut Eakle broom. The reverse side illustrates a traditional hand-carved measuring cup or naalhi that has lacquer work detailing on it. 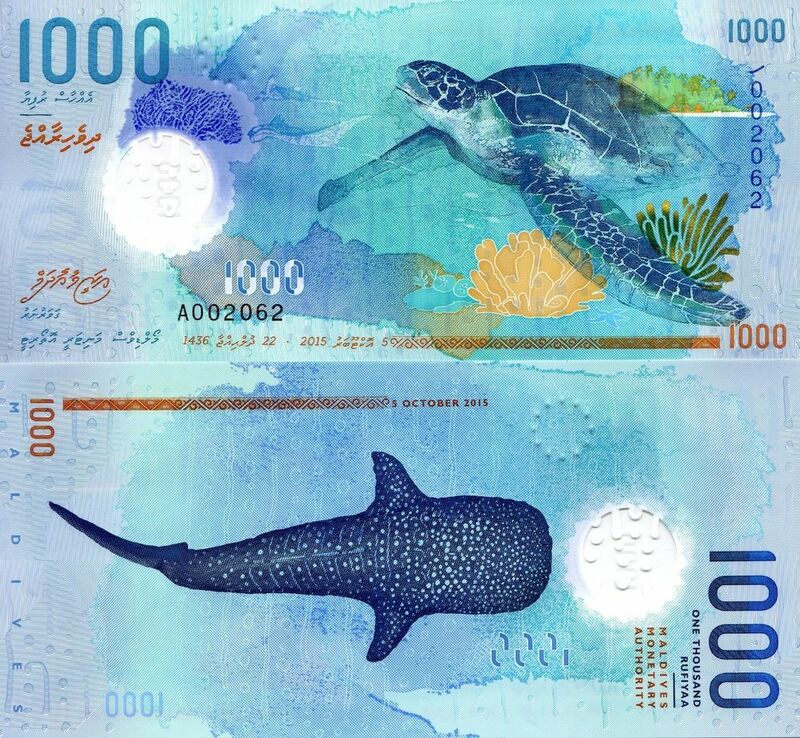 The blue banknote that depicts the underwater beauty of the Maldives took second place in the International Bank Note Society (IBNS)’s Banknote of the Year 2016. The illustrations show some rare, endangered and protected marine species on the front side of the note, with corals and an island in the background. The reverse face shows the Fehurihi or Whale Shark; a gentle giant that can be seen in the Maldivian seas all year round. They are mostly seen in the South Ari Atoll, a Marine Protected Area and the Baa Atoll Biosphere Reserve. Next Article Is Your Sunscreen Killing the World’s Reefs?